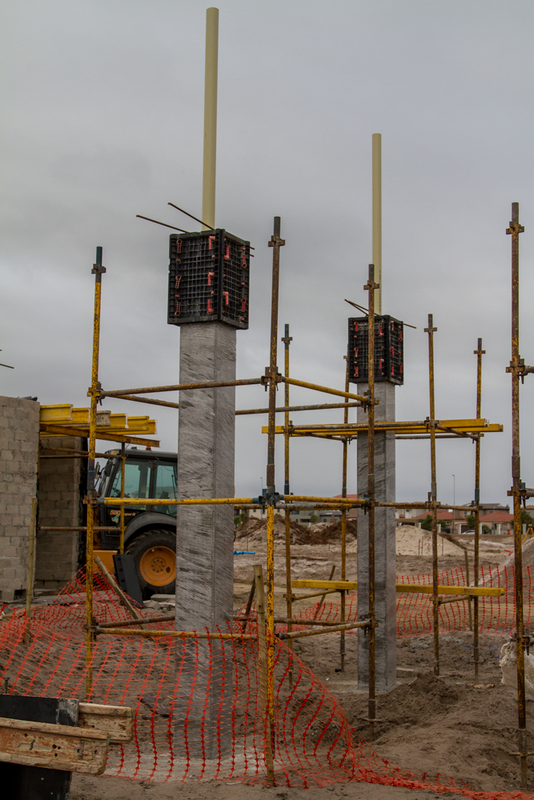 Geotub Panel, the modular formwork for square and rectangular columns by Geoplast, was used in the latest residential district by Balwin in the heart of Parklands, Cape Town. "The Sandown" development offers spacious living apartments with a wide range of leisure, entertainment and sport facilities. The project required 9 columns, 4.50 mt high for the security booth at the entrance of the complex. The Architect’s request for an excellent finish and no plastering were met by this innovative formwork, which has proven to be perfect because of its fast installation and the particularly smooth internal surface that always guarantees an excellent final result. The formwork is made of ABS and can resist up to 60kN/m2. It offers many advantages in terms of lightness, speed and modularity. Weighting only 8 kg, the panels can be easily handled, and moved to and around the work site. Moreover, the panels can also be reused for more than 100 times when properly washed and maintained. No release agents are necessary. Structural benefits wish high aesthetic impact. Get in touch to find out more about Geoplast's innovative reusable formwork range.